The 40 Hour Jammin was created by renowned Brisbane violinist and composer Shenzo Gregorio in response to his mother contracting Motor Neurone Disease. Feeling a sense of wanting to help those who have this crippling disease Shenzo pitched the idea to the MND and Me Foundation to hold a fundraising event where he would play for 40 hours non stop. Some 50 musicians joined Shenzo towards reaching his goal and events have been held in Brisbane and on Magnetic Island. It’s on again this year on Magnetic Island and we have pitched in to rally behind Shenzo by doing 40 hours of Tai Chi Qigong. 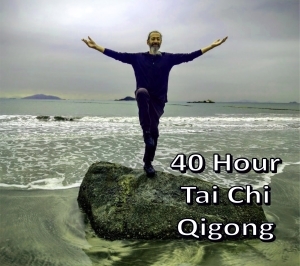 For something completely different join Rod as he attempts 40 hours of Tai Chi Qigong and walks between all locations for the 40 hour Jammin. From the jetty at Picnic Bay to Amaroo on Mandalay, Alma Bay, The Forts, Horseshoe Bay and an overnight mystery location, you’ll get to experience the entire jam on foot taking in some of the best locations Magnetic Island has to offer – doing Tai Chi Qigong along the way. Tai Chi Qigong should never be locked up in a little box apart from the rest of your world, but instead, a positive influence through all aspects of your life. The synergy of Tai Chi Qigong played along with wonderful music is a great experience for everyone. Just try it! As we tune into ourselves and our surroundings, we will take advantage of many beautiful locations for our various sessions, with a special focus on sunrise, sunset and the full moon rising. Throughout the weekend you can join in any session, just watch the performance, ask any questions you have or perhaps even get your own private lesson. During ticketed musical acts, Rod will be doing performances, self practice, or Tai Chi Qigong head and neck massage available for musicians and other attendees. Look for the ‘Massage Bookings List’ at each event. Workshops will be suitable for beginners through to advanced levels. There will be a focus on principles and understanding rather than just movement. Simple, easy to follow exercises and techniques will be used so that everyone can participate and enjoy their time in the beautiful surroundings. All sessions will be by donation to the “40 Hour Jammin” and/or a collection box at each event. See below for Event schedule. Whether you can come or not please support our efforts by donating to help raise much-needed funds for Motor Neurone Disease (MND) Reseach. No amount is too small – every bit helps!